A procession of 10,000 people to the Cenotaph will give “a nation’s thank you” to those who laid down their lives in World War One. It marks 100 years since Armistice Day, when WW1 officially ended on the 11th hour of the 11th day of the 11th month. A series of a special events across the country are honouring those who died. Portraits of casualties of the war will appear on beaches around the country as part of an event created by film director Danny Boyle. In Folkestone, where millions headed to the Western Front, there will be a 60m image of war poet Wilfred Owen. The Queen and senior royals will attend London’s Cenotaph for the national remembrance service. Renovations of Big Ben have been paused so the bell can chime before and after the traditional two minutes of silence at 11:00. Services of remembrance will also be held at Llandaff Cathedral in Cardiff, Glasgow Cathedral, St Anne’s Cathedral in Belfast and Westminster Abbey in London. More than 1,000 beacons will be lit across the UK, starting at Westminster Abbey. The lights are intended to symbolise the end of the darkness of war and a return to the lightness of peace. In France, where many of the battles of the Western Front were fought, 60 world leaders are gathering. French President Emmanuel Macron will meet them for a ceremony at the Arc de Triomphe in Paris. Among the guests is US President Donald Trump, who was criticised on Saturday for cancelling his trip to the Aisne-Marne American Cemetery and Memorial, due to scheduling conflicts and bad weather. Sir Nicholas Soames, a Conservative MP and grandson of wartime leader Winston Churchill, branded him “inadequate”. 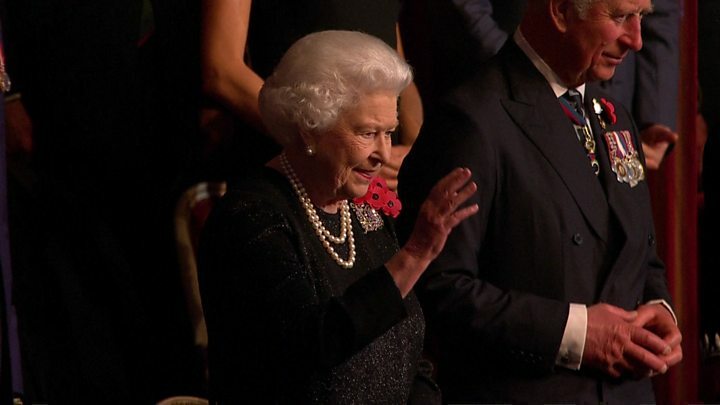 On the eve of Armistice Day, the Queen and senior royals attended a remembrance concert at the Royal Albert Hall. The dukes and duchesses of Cambridge and Sussex, and Prime Minister Theresa May were among the audience at the annual Festival of Remembrance. The royals stood as thousands of people in the audience held up photos of World War One soldiers – including Mrs May and husband Philip who held pictures of two of her ancestors. A candlelit vigil was also held on the eve of Remembrance Sunday at the National Memorial Arboretum in Staffordshire.